Microscope World is proud to introduce a new high resolution stereo zoom high definition (HD) digital microscope with LCD monitor. The FZ6-HD-LCD stereo microscope system was created specifically with quality control and industrial soldering work in mind. 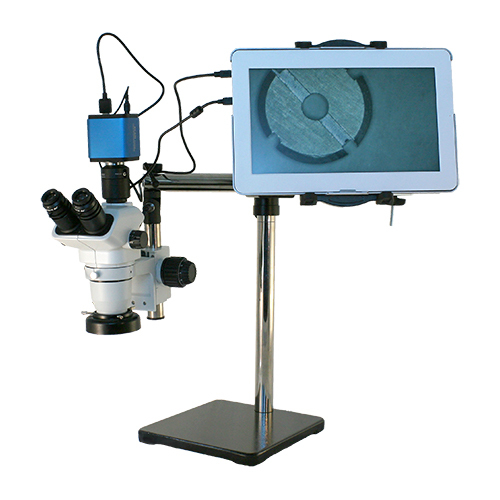 The high definition camera paired with the 1080p LCD monitor relieves eye strain caused by hours looking through the microscope at small parts or while soldering. The high resolution stereo zoom microscope system has been designed with a large working distance of 177mm (7 inches) to allow room for working under the microscope. An extension post for the boom stand provides extra room for larger parts under the microscope. A four-quadrant LED ring light as well as a polarizing filter eliminates glare when viewing metal parts. Zoom magnification of 5x - 67x allows for a wide range of magnification options. The HD camera provides high definition quality resolution with a high speed frame rate of 60 frames per second at full resolution, eliminating jumpy movements under the microscope. Additionally, an SD card can be used to capture and save images quickly. The 13" monitor provides a large and clear image. For more information on stereo zoom HD microscope systems contact Microscope World.